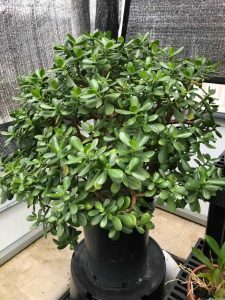 Jade, or Crassula ovata, are popular houseplants worldwide due to the low level of maintenance required. Jade plants are succulents – they require very little water to thrive, and can survive in most indoor conditions. 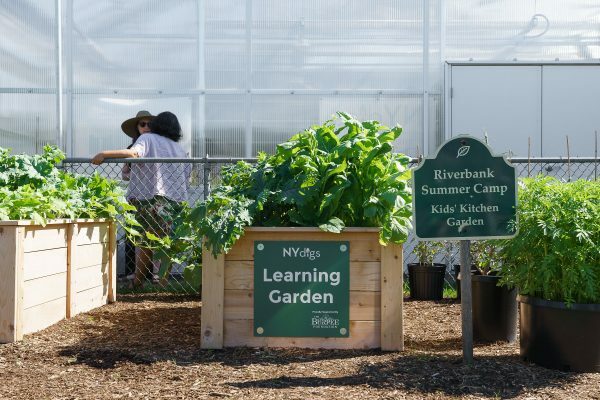 Healthy plants will live for a very long time, and can survive long periods of drought due to its ability to store water in its leaves, stems, and roots. Jade is native to South Africa, and can grow up to six feet tall. In some parts of the world, jade plants are associated with financial luck, earning the nicknames “money plant” and “luck plant.” The jade plant is also known for its ease of propagation – plants will readily propagate with high success rates from both clippings and fallen leaves. In the wild, propagation from fallen branches is the jade plant’s primary form of reproduction. Jade plants have small pink and white flowers that bloom in the springtime, but may not appear on plants kept indoors. Ramps are wild, and now well-known at most farmers’ markets. They look like very skinny scallions but have a stronger, garlic-like taste. They start showing up at markets in early spring. Without ramps, substitute about half the amount in scallions, plus a small garlic clove, well minced. Preheat broiler. In a medium (8-9 inch) ovenproof skillet (preferably cast iron), heat about 2 tablespoons of olive oil over medium flame. Add the ramps and sauté until tender and fragrant, about 4 minutes. Season with salt and black pepper. Remove to a bowl and set aside. In a small bowl, add the eggs and beat lightly to blend. Set skillet over medium heat and add enough olive oil to coat the skillet well. After a few seconds, add the egg mixture, shaking the pan a bit to make sure, it spreads out evenly, and return the sautéed vegetables to the skillet. Let cook undisturbed until you see it is starting to brown lightly at the edges, about a minute. Shake the pan to see if the frittata mixture is loose. If not, let it cook a few seconds longer. Don’t stir, just let the bottom set and even brown a bit. When the top is just starting to set (that is, it doesn’t look totally runny anymore), take the pan off the burner and stick it in a hot oven (or under the broiler, but watch it closely so it doesn’t burn). Cook another 5 minutes or so until the top begins to brown. If you don’t have an oven, you can flip it and cook the top in the skillet. 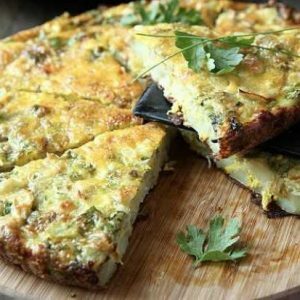 The easiest way is to slide the frittata onto a plate, put another plate upside down on top, flip it all over, then slide it back into the hot pan. To serve as an antipasto, cut into thin pie-shaped wedges and arrange on a serving platter. For a lunch dish, slide each frittata slice onto a plate and serve with a green salad. 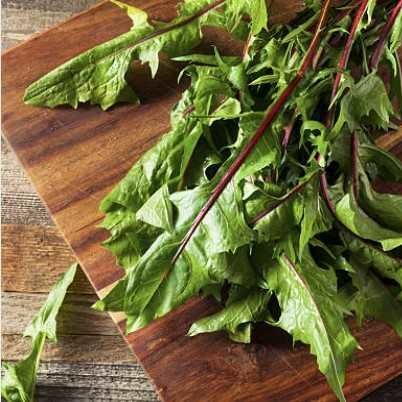 Note: Dandelion greens can be foraged, however make sure you clean well and rinse a few times before using. Many supermarkets also carry them in the produce section. You may also substitute other greens like spinach and arugula. Combine all dressing ingredients in a jar with a tight-fitting lid; shake well. Dress salad in a large bowl and serve.